If you have space and a suitable growing site why not grow your own sustainable willow plants for craft projects at your school or home. Willow cuttings are a great way to start a basketry garden or plant a large area such as a stream bank for erosion control or extensive area for windbreak or privacy. *please note, colours and growing habits may differ depending on soil and growing conditions of your site. We harvest your cuttings fresh in the spring, once harvested we can ship them directly to you or you may pick them up at the farm. They must be planted as soon as possible, as soon as the frost is out of the ground. You do not have to wait until the soil has dried or warmed up. The following is a list of the willow we have available. 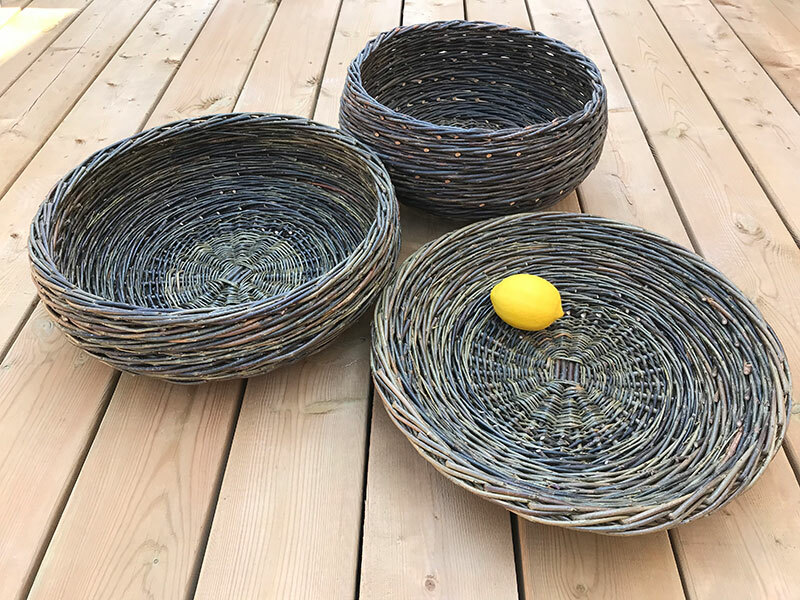 If you are looking for the best basketry willow we suggest the all of purpureas, stream, belgian red, hutchison’s yellow and acutifolia. Basketry willow is coppiced every year. Each stool produces between 10-30 rods of varying height depending on the variety. In the list below we have provided a mature height of each variety if left to grow without coppicing. For more information about salix varieties please visit Vermont Willow Nursery. Cuttings are $1.75 each, minimum order of 30 cuttings. Plus taxes and shipping, (if applicable). Cutting varieties available for sale are listed on our order page. Willow Garden Bed: Includes 45 Cuttings of 5 varieties of your choice plus landscape fabric, sod staples and instruction. Garden planting area is 10ft x 10ft. $119 plus taxes and shipping, (if applicable). Willow structures transform the landscape. There are many ways willow can be used in the garden, park or school yard as shelters, privacy fencing, living sculpture, and play huts. A quick way to establish privacy in a garden is to grow a willow fedge (hedge+fence). Plant willow rods and weave them together, then either prune the lower growth to create an open lattice effect leaving all of the new growth on top, or let it grow along the stems for an instant privacy hedge. Living willow is very easy to plant, all you need is a site with half day sun, a water source and some imagination. If you are planning a large structure, such as a maze or arbour, you can purchase willow rods for your own design. We offer living willow rods for sale in March or April (depending on the spring thaw). Pre-order your rods now, quantities are limited.